The American Academy of Pediatrics just updated its screen time recommendations – and, for the first time, we can actually see and understand the research on which the recommendations are based. They’re a bit more nuanced than the previous versions, so join me as we walk through what the recommendations mean for parents of babies and toddlers – whether or not your children have been using screens until now. We’ll look at the impact particularly of TV on cognitive development, obesity, and prosocial vs. antisocial behavior. News flash: if you’re not watching and discussing shows WITH your child, he may be learning antisocial behavior from even the most innocuous of PBS programming. This is the first in a two-part series on screen time. Here we focus on what science says about the impacts on development. In the second part we’ll examine what we can do about mitigating these impacts and on harnessing some of the good that digital media can do for our kids, since they are growing up in a world where the use of digital media is a fact of life. Beales III, J.H., & Kulick, R. (2013). Does advertising on television cause childhood obesity? Journal of Public Policy & Marketing 32(2), 185-194. Blankson, A.N., O’Brien, M., Leerkes, E.M., Calkins, S.D., & Marcovitch, S. (2015). Do hours spent viewing television at ages 3 and 4 predict vocabulary and executive functioning at age 5? Merrill-Palmer Quarterly 61(2), 264-289. Bronson, P. & Merryman, A. (2009). Nurtureshock. New York: Twelve. Hello and welcome to the Your Parenting Mojo podcast. Today’s episode is called “really, how bad is screen time for my over two year old?”. So this episode had some remarkably fortuitous timing – I was actually half way through writing it when the American Academy of Pediatrics updated its guidelines on screen time for children. Cue the scramble to update my research – I was just grateful I hadn’t already recorded and released an episode that became instantly out of date! The old guidelines said that “Television and other entertainment media should be avoided for children under age 2.” In my mind that was a bit of an anemically worded recommendation given that it follows a paragraph stating that “Studies have shown that excessive media use can lead to attention problems, school difficulties, sleep and eating disorders, and obesity. In addition, the internet and cell phones can provide platforms for illicit and risky behaviors.” When I looked around I found that the AAP’s policy had been much more restrictive until just May of last year – it used to recommend that parents avoid screen time completely for children under the age of 2, and to limit screen time to no more than two hours a day for children older than two. But apparently the AAP realized that 38% of children under age 2 had used a mobile device and 74% of children under two have watched TV before the age of 2. 43% of children under the age of 2 watch TV every day and 18% watch videos or DVDs every day, so clearly parents mostly weren’t following the guidelines, which I’m guessing is what prompted the new guidelines that seem to try to walk a narrow line of recommending less rather than more screen time, but also acknowledging that parents do let their children use these devices in spite of the AAP’s recommendations. So what do the updated guidelines say? They’re considerably more nuanced than the old ones, which had previously been explained in just a few short paragraphs, and it’s also a bit harder to figure out exactly what the recommendations are because they’re buried below a bunch of preamble BUT I was excited to find that the preamble is fantastically well-referenced, rather than just consisting of a few statements that seemed to appear out of thin air with no basis in any research, which is what the old version seemed like. So here’s the really important stuff: For children younger than 18 months, discourage use of screen media other than video chatting. The scientists who wrote the recommendations cite a study showing that even parents who tended to adhere strictly to the previous “avoid screen time for under twos” statement would permit the use of video chatting, and while there’s no evidence of benefit from video chatting there’s no evidence of harm either, so given that video chatting tends to be a social interaction – which is usually associated with cognitive development – researchers seem to be sort of assuming that video chatting is probably OK. I heard an interview on NPR with one of the lead authors of the guidelines a couple of weeks ago and she said they are designed to be “realistic and broadly applicable,” which seems to account for the use of the word “discourage” when describing screen media use for under 18 month olds – the researchers don’t want to encourage anyone to introduce screens before age 18 months, but they also don’t want to alienate the parents who do decide to do it. Alright, so for the 18-24 month olds, again, there’s no pressure to introduce screens but if you do use them, the researchers advise using them as a teaching tool and as an activity you do together, not as something you use to help them calm down or something to keep them occupied. The idea behind not using media to calm them down and avoid tantrums is that using media as a calming strategy could lead to problems with limit-setting if children don’t learn to develop their own emotional regulation and always look to devices to help them calm down. The researchers cite the websites Common Sense Media, PBS Kids, and Sesame Workshop as examples of quality programming. In children older than two years, the recommendations say that parents should limit media to one hour or less per day of high quality programming. The limit addresses the idea that children need other activities in their lives as well, and that screen time can displace these activities if children are on their devices for too long. Again, the ideal is for high-quality children’s programming that you watch together rather than it being a solo activity. Parents may need to help children understand what they’re watching, and help them apply what they learn to the world around them – so if you watch a program on bugs and then you go out and look for bugs, you could talk about what you learned in the program that can help you understand the bugs in real life. Children may not understand the things they see in two-dimensional environments as much as they do if someone explains it to them – the same holds true for books as well as TV, but because a parent is usually reading the book the child gets a chance to ask questions which improves their understanding. Parents should also monitor what children are doing on their devices, test apps before the child uses them, and engage in conversation about the child’s screen time. Finally, the guidelines talk about when devices *shouldn’t* be used – that includes meal times, times when you’re playing with your child (and that goes for parents too). Screens in bedrooms are not recommended, and children shouldn’t use devices within an hour of bedtime. We’ve generally followed a “no TV” policy with our toddler until she was two. She also isn’t allowed to play with our phones – she doesn’t have any apps on them. She does watch videos with her Dad on his phone; usually videos of herself but there’s also one of our friend’s drone that she is strangely attached to. But that’s five or ten minutes a day on weekends. Recently she had an ear infection and had to stay home from school unexpectedly, so I had to stay with her, and I still needed to get work done. I offered to put on the movie Penguins which she was quite interested in for five minutes, but then she got bored and asked me to turn it off, but then she wanted it on again, and then off again…and for several days afterward she campaigned to watch it. It gave me a taste of what we might be getting into if we started to allow her to watch TV, so we backed off it again and haven’t let her watch it since. But I know some parents approach this differently and do allow TV watching so I wanted to try to understand what really are the impacts of TV on children’s physical and cognitive development? Does some kind of switch flip at age 2 where it suddenly becomes “less bad”? And a neighbor of mine asked whether having TV on all the time as ‘background noise’ might be better than just watching a few shows because then children might get desensitized to it and stop paying attention? There’s a lot to untangle when it comes to the research on TV viewing in children so let’s dive in. The impact of TV on children’s development may differ at different points in the lifespan, so there may be a “sensitive period” for the effects of TV viewing on children’s cognitive development. Executive functioning is a term that means a set of related skills involving working memory, cognitive inhibitory control, and attentional focusing and flexibility. Now let’s go through what each of *those* mean. Working memory is the way you hold multiple pieces of information in your mind at once and manipulate this information. Cognitive inhibitory control means suppressing dominant information in favor of not dominant information. Attentional focusing and flexibility refer to the ability to focus and shift attention in response to change. I think about this in terms of an example – maybe you’re watching a complicated movie on TV; the kind with multiple plot lines and you’re trying to figure out what’s going on. Your child wakes up upstairs and starts crying quietly. You need to suppress your thinking about the movie to assess the noises you hear from your child and decide whether it’s the kind of crying that needs your attention or not. In making that shift you demonstrated attentional focusing and flexibility. So both executive functioning, which is all of those concepts taken together, plus vocabulary development, are really important in the preschool years because they’re among the strongest predictors of early academic achievement. One study found that watching child-directed programs at ages 2 and 3 was associated with better word comprehension at age 3, but the very same study found that children who viewed more general education programs at ages 2-5 had lower word comprehension at ages 4-7. The authors of another study suggest that children already have to have a good store of vocabulary to be able to pick up new words from watching TV – in other words, they have to understand what they’re watching, which I suppose is why children’s programming is associated with an increased vocabulary but general educational programming isn’t. The evidence for or against the impact of TV on executive function development seems to be pretty mixed. One study found that children have a shorter focused attention span when a TV is on in the background, even though they didn’t have more episodes of focused attention with the TV off. Four year olds living in homes with more adult television programming were rated as having lower executive functioning skills by their parents than children who lived in homes with less adult TV watching, but children’s programming didn’t seem to have the same effect. And another set of researchers had children wear a digital recorder on random days for up to 24 months, which recorded the amount of TV they watched, as well as the words they said and the words other people said to them. IT turned out that each hour of TV the children were exposed to, even if it was just background noise, was associated with less talking by the child and also less talking by the parents to the child. There are some days where I might wish my daughter didn’t talk as much and this study shows that TV would be a good way to keep her quieter, but at the end of the day the more she talks and the more I talk with her, the better her language development gets. And, finally, a third study found that a greater cumulative number of hours of watching TV, starting to watch TV at a younger age, and watching media that wasn’t explicitly developed for children are all linked with poor executive functioning in preschoolers, although the study authors noted that they were able to show correlation, not causation – they couldn’t prove that watching TV causes these detrimental effects. Because it seems as though having a TV on or not having a TV on are not the only factors at play here. It’s also important to factor in the extent to which toys and learning materials are available at home, the extent to which parents teach children and provide enrichment, and even scaffold children’s learning (there’s a lot more about scaffolding in the Your Parenting Mojo episode of that name). 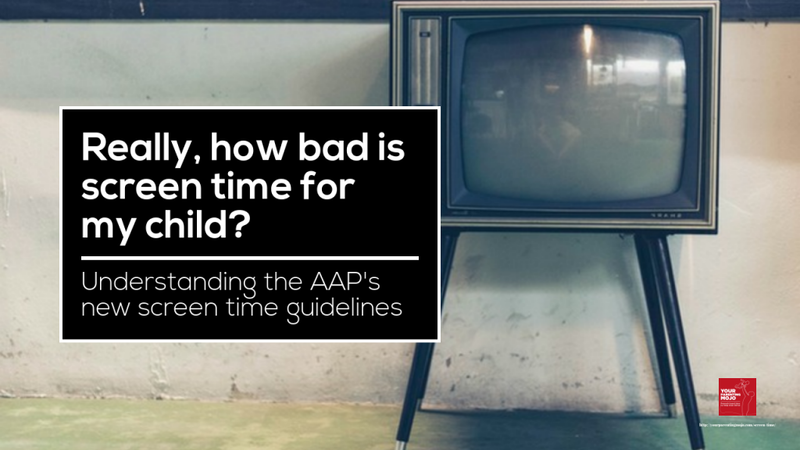 The AAP’s original recommendation to ban screen time for under-twos was based on the idea that if children are watching TV then they’re not interacting with people, and interacting with people is how children learn best. So researchers theorize that it’s not whether or not a child watches TV that’s the most important factor, it’s whether he lives in a home that otherwise supports his cognitive development. When TV viewing is considered along with cognitive support that the family provides, TV viewing at ages 3 and 5 isn’t associated with vocabulary or executive functioning at age 5 and that in fact ONLY parental scaffolding was associated with vocabulary and executive functioning. These children were only watching about 10 hours of TV a week, though, so this finding may not hold true for children who watch a lot more than that – another study found that children who watch TV more than three hours a day fell behind the language development of their peers each year between ages 4 and 7, despite the fact that the two groups had essentially the same language skill at age 4. The researchers in one of the executive functioning studies also didn’t collect data on whether the children were watching children’s programming or adult programming, which is a pretty big confounding factor given what we already heard about the type of programming being important – although even within children’s programming, different programs have been associated with different outcomes. The PBS Kids show Arthur, which I hadn’t previously heard of, is apparently associated with good language outcomes while Teletubbies is associated with negative outcomes. And when you consider that children who parents might think of as “high-strung” and “needing to be calmed down” are offered screen time as a way to give parents a break, it becomes even harder to tease out in which direction the causality lies – has the TV viewing caused the difficult behavior, or did the difficult behavior cause the parent to let the child watch TV? Or is there some kind of self-reinforcing loop going on here? We just don’t know. A study of 467 children aged from 4-6 in Iowa found that the children in the study who exercised for 17 minutes or less had average body fat percentages that were 4% greater than the children who exercised for 35 minutes or more each day. And body fat percentages for children who watched TV the most were 3% greater than those children who watched the least amount of TV. And the researchers could tell through their statistical analysis that watching TV and exercising aren’t linked in predicting overweight, so you can’t make your kids run around outside for an hour and expect that to offset the effect of sitting in front of the TV on their fatness. And these effects can be long-lasting – one study found that mean daily hours of TV watched on the weekend (but, strangely, not during the week) at age 5 predicted a higher body mass index 25 years later at age 30. Each additional hour of TV watched on the weekend predicted another 7% of increased BMI. One might think that exposing children to commercials during TV viewing is partly responsible for their weight gain, and one might be right – while I did find one study that found “no support for the hypothesis that food advertising produces the relationship between TV viewing and BMI,” if you look a little more closely you find that that study was funded by General Mills, the Association of National Advertisers, the Grocery Manufacturers Association, and the American Association of Advertising Agencies. If there was ever a group of organizations who wouldn’t want to find that TV viewing causes obesity, I’d say that group would be it! A large variety of other studies have shown all kinds of links between TV viewing and factors that are related to obesity. Exposing children to food advertisements causes both overweight and normal weight children aged 5-7 years to eat more in an experiment. Children who recognize food advertisements are significantly more likely to eat more after watching these advertisements, and are also more likely to have a higher body mass index. But as with the impacts of TV on cognitive development, this isn’t just one thing happening in isolation. We can’t prove that TV causes fatness because there are a lot of other factors at play in houses where children watch TV. One study that the AAP recommendations cite found that children’s obesity at age 2 was predicted by shorter breastfeeding duration (as little as a month extra of breastfeeding seemed to help! ), earlier introduction of solid food, and maternal overweight and obesity. More time spent watching TV was significantly associated with body mass index but not weight (so, shorter children tended to be fatter but not taller ones), which is a bit more of a nuanced finding than the AAP recommendations say. Taking all the evidence together, though, it seems likely that there is some relationship between TV watching and obesity and in general, the more TV your child watches the more likely he or she is to be obese. A meta-analysis of 39 studies aimed to figure out whether children in experimental settings and at home who watched prosocial content on TV (so, programming that encourages altruistic, self-sacrificing behavior) behaved significantly more positively or held significantly more positive attitudes than those who didn’t watch prosocial programming. The authors of this study say that “this is striking news and should serve as something of an antidote to those who consider television to be nothing but detrimental.” True enough, but this leads to an awful lot of parental supervision needed to monitor that TV content, since children’s consumption of media violence early in the school year between 3rd and 5th grades predicted higher verbally aggressive behavior, higher relationally aggressive behavior, higher physically aggressive behavior, and less prosocial behavior later in the school year – and this is one of many studies that have found negative effects associated with viewing of media violence. I was also reminded of a chapter in the book Nurtureshock that I read a while back that referenced a study by Professor Jamie Ostrov at the University of Buffalo. I went and found the study and buried deep in the discussion section was the surprising finding – that educational media exposure was correlated with future observed relational aggression. In other words, when children watch educational programming, they later show aggression by damaging relationships or someone’s social status. How on earth could this be? It turns out that the children were learning to be aggressive from shows like Arthur, which seems to be about as innocuous a show as you could get – as I mentioned, I hadn’t heard of it so I also haven’t watched it, but its Wikipedia page says the show deals with “important issues families face such as asthma, dyslexia, cancer, diabetes, and Asberger syndrome. It also encourages reading and relationships with family and friends by explaining that people have different personalities and interests.” Professor Ostrov theorized that it’s the way these topics are dealt with that’s the problem – children might be shown ostracizing friends on the playground at the beginning of the show, and at the end of the program the children reconcile. But very young children can’t hold information in their heads for that long, and likely can’t connect the plot at the beginning of the show with the resolution. They don’t recall the ostracizing behavior from 30 minutes ago in the context of the ultimate plot resolution and then take away the lesson “some people aren’t nice to their friends, but it’s really better to be nice;” they learn how to ostracize and they learn how to make up and and then they put *both of those* behaviors into practice. This may be especially true for girls, who may pay more attention to storylines about relationships than boys. These findings were so unexpected that Professor Ostrov replicated them in a 2013 study. In that paper he cites research showing that only 19% of five year olds tested could identify the correct moral lesson in an episode of Clifford the Big Red Dog, which is a show on PBS, whereas 89% of the children described irrelevant information and misunderstood or misinterpreted the intended moral lesson. Professor Ostrov cautions that both of these studies were small and could not account for all of the things in the children’s lives that could impact their relational aggression, including the fact that children who watch a lot of TV may receive less scaffolding from their parents on how to navigate social relationships. But it does make an extra argument for parents to watch TV with their children rather than leaving the children to watch solo, and preferably to engage in an active discussion about what’s going on in the program and what is the lesson to be taken away from it. I found a review study which looked at 29 other studies that have created “interventions” to reduce TV viewing, to see if these interventions were successful. The overall conclusion was that the studies in totality did have a small but significant effect on reducing TV viewing behavior but rather disappointingly the authors made no attempt to tell us which method is the most effective. Of the 29 studies, eleven had some kind of behavioral component – tokens were earned for physical activity that could be used to run the TV, or maybe the TV would be operated by the child pedaling a bike in the same room. Think back to what we learned in episode 7, though, about getting children to eat more vegetables. If we make vegetables the “gateway” food to earning target foods like ice cream, then children end up disliking the gateway food more. So by making exercise the gateway to TV we aren’t really helping the child to like exercise, we’re just teaching him to get through it to get to what he really wants – watching TV. The majority of the remaining studies included or consisted of education – educating children about the benefits of exercise and the harms of TV, or educating parents about the benefits of exercise and the dangers of obesity and so on. Some of the more successful interventions involved using a television control device to restrict access to the TV, although I’m guessing the researchers assumed that just because the TV was off at home meant that the child definitely *wasn’t* heading over to a friend’s house to watch TV there. What struck me as I was reading through the list was that they all assume that there’s a one-size-fits-all approach to fixing the problem of watching too much TV and while some of the studies looked at the physical and/or social environment, none of them attempted to connect all the dots to truly understand all the reasons why an individual child watches TV. I just finished a class for my Master’s degree in Psychology where I learned about a psychologist called Urie Bronfenbrenner who developed something called an Ecological Systems Theory. If you imagine a child who watches a lot of TV at the center of a circle, there are a series of rings around that center circle that describe systems that touch the child. The closest rings are the institutions and groups that touch the child directly – her family, her school, her church, her neighborhood, her friends, etc. As you move outward through the rings you look at settings that the individual doesn’t have as much control over like how much a parent needs to work (which might mean the child uses the TV to entertain herself because the parent is away and the child feels there’s nothing else to do), and the cultural systems that impact us like her socioeconomic status, her ethnicity, her culture’s heritage and values, and so on. The final element is concerned with timing – both the historical timeframe that the child resides in and the timing of things going on in her life. So perhaps the historical timeframe has made it more socially acceptable for her mother to work, which explains why the child needs to keep herself occupied in the afternoons. Or perhaps her parents are divorcing, which brings about a lot of change and maybe TV characters provide some sense of continuity for her. So what I noticed about all of these studies trying to reduce TV viewing in children is that *none* of them make any attempt to understand the ecological system surrounding the child. *All of them* assume that if you can reward the child for not watching TV, he won’t watch it. Or *if only the parent understood* the dangers of having a fat child, he would make the child turn off the TV and exercise more. But maybe the parent feels bad about having to work long hours and wants to give the child what she wants, so the child is allowed to watch TV. Maybe the family can’t afford the dance classes that the child wants to do. Maybe there’s no safe place to play a game of pickup basketball. Maybe the child is bored, or lonely, or who knows what – and we don’t know, because we never bothered to ask. I had already started drafting this section when I heard a piece on NPR explaining the new AAP guidelines – it was on the show Forum, and the moderator was interviewing Professor Jenny Radesky who was an author of the guidelines and Caroline Knorr of Common Sense Media, a nonprofit organization that is “dedicated to helping kids thrive in a world of media and technology.” Having read all these studies on different types of interventions I emailed into the program asking what the panelists would suggest for ways to reduce screen usage – you can hear my question and Caroline Knorr’s answer starting at 13:29 in the show replay, which his listed in the references. I was grateful to hear that their advice was much in line with what I was going to describe as a potential way to drive toward reducing your child’s screen time usage. My suggestion to you would be to turn off the TV, if you can, and engage your child in a real conversation. Ask him why he watches so much TV. Ask him what’s stopping him from turning it off and doing something else. Caroline Knorr suggested really trying to understand what he’s getting out of his media use – does getting to the next level on a video game give the child a sense of mastery that he’s lacking elsewhere in his life? Is he using it to socialize with friends? Then work together to come up with ways to achieve those functions and goals without using as much screen time. If you need more guidance on how to go through this process, I have a couple of resources for you – there’s a fantastic book called How to Talk so Kids will Listen and Listen so Kids will Talk that provides a framework for this kind of discussion. I’m not saying it’s as simple a process as I’ve just described; there may well be some negotiation where he proposes cutting back from 40 to 39 hours of TV viewing a week and you have to say that that won’t work for you. But maybe there are some ways to support him in finding other things to do that you wouldn’t have figured out if you hadn’t asked him, or neither of you would have figured out by yourselves. And if you need help figuring out what could be some appropriate boundaries around media use the AAP has developed a guide to creating a media use plan that you can find at healthychildren.org/MediaUsePlan – I’ll put a link in the references. Because if you just assume that you know what the problem is and decide for yourself what you’re going to do to change it then you may end up with a host of unintended consequences. If your son loves TV and you just throw yours out, he’s probably going to end up at his friend’s house a lot more. But if he’s actively involved in understanding the problem and in generating potential solutions – which may involve him watching an amount of TV that you both decide is reasonable, then he’s much more likely to be held accountable and to hold himself accountable. Isn’t it worth a try? So what am *I* going to do with all this information? We’re continuing to be a mostly screen-free household, which means no TV, no child-led entertainment on any devices, and only occasional supervised watching of videos and Skpying with grandparents. But my primary reason for doing this is not because of the impacts on cognitive development, physical development, and prosocial development that we’ve seen – it’s because I just don’t want my daughter to be on a device all the time, and I don’t want to have to navigate limit setting around what is acceptable not-completely-supervised use. I don’t want to have to say that 30 minutes of TV a day is OK but 45 minutes is not, or deal with the inevitable tantrums that will result when it comes time to turn it off. I don’t believe TV is evil, but I don’t think it really has any benefits that I’m not getting by engaging in other activities with my daughter, so why even bother with it? My daughter is going through a clingy phase right now where she wants to be right next to me all the time. Maybe it would be easier to get things done if I put her in front of the TV for a while. But to me it seems like by coping with her clinginess as it comes, even if it sometimes drives me a bit nuts, I’m building a relationship with her. By putting her in front of the TV, I’m avoiding doing that. And at the end of the year when I reassess my priorities for the year and think about things I want to do differently next year, I don’t want to have to set a priority to spend more time with my daughter. Because while I believe it’s healthy for us to have time apart, it’s also healthy for us to spend the time when we’re in close proximity to each other building a relationship. At some point we might need to have a negotiation about how much TV she wants to be able to watch and at that point I may be willing to modify my position. I’ll certainly hear her arguments and will attempt to negotiate a mutually beneficial outcome. But for right now it seems as though the largest benefit comes when the TV stays off. Thanks, as always, for listening – I hope this show has given you some tools to navigate screen time with your own child. You can find the references to the 22 books, studies and websites I consulted in writing this episode on YourParentingMojo.com/AAPScreenTime. Jenny Radesky – media and young minds report lead author. After 18 months babies can learn from screens where parents scaffold this process by using language elsewhere in the day. Below 18 months they don’t understand the content of what’s on the screen. Risks – poor sleep, slight risk of obesity, executive function development. Limited evidence for whether app interactivity is beneficial; possibility if the app contains a lot of scaffolding startinga t 24 months. Have unplugged time during the day – during meals, before bed (promotes sleep), have outdoors time so kids’ brains are taking the lead in the play. Enjoy parenting and don’t be distracted. Recos take away guilty feelings; previous recos based on excessive use; using as a babysitter. New recos – kids possibly can learn from media as long as parents are involved and you don’t over-rely on it. No studes directly done on early media use on visual-motor coordination/fine motor control, but some studies that kids who use inappropriate adult media have EF difficulties. Kids who engage in block play, legos, mazes, sensory input- feeds into the brain to build 3d space of the world; builds math and science skills. Guidelines try to be realistic and broadly applicable. No pressure to introduce screens, but if you want to introduce it early you have to use it as a teaching tool, not a calming down tool or a solo experience that you expect to be educational, especially if it displaces hands-on activities. One-hour limit addresses the idea that kids need other activities. When kids ask why they can’t watch TV – kids don’t want to hear ‘it’s bad for you.’ Being logical/bribery aren’t working. What function is the media use serving for this child/me/the family? Is it giving the child a sense of mastery over something they don’t’ have elsewhere/social connection with friends/creative outlet – what’s the function of this behavior? How canw e replace that activity with another that would serve the same purpose. If you need to keep kids busy while ou prep dinner, what other activity could hold their attention? Hard to compete with screens because they’re designed to be angaging. Parents are responsible for setting thelimit and I’m going to show you how awesome it is to do other stuff; kids find it’s interesting to then go for a walk/take pictures/use tech in other ways. Rudesky – interviewed parents to ask what they are experiencing when they use tech around kids – work emails, news – requires cognitive/emotional response; makes it hard to respond to child. Eating together – parents yell at child in fast food restaurant. If it’s something light like a sports game, where everyone watches together, I don’t discourage that.